Sometimes the smallest of things can make a big difference. Like an extra bit of syrup on your pancakes, five more minutes time before you have to go to work or best yet perhaps, a few minutes more of sleep. The point is that we all do pretty much the same things, we eat, work and sleep; and we all like it when there’s something, no matter how small, that makes the ordinary thing a little extraordinary. 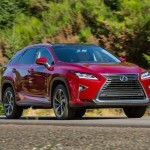 This thought occurred to me this week as I tooled around the roads in Central Florida is the latest SUV crossover offering from Lexus. 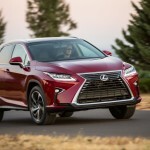 The previous three weeks had seen in prowling the same roads in other crossovers, and while they were all pretty good, the new 2016 Lexus RX 350 was better. 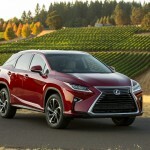 The RX 350 is the bestselling vehicle in the Lexus lineup. It’s a luxury crossover that can be seen in suburbs all across America. It competes with the likes of the Mercedes-Benz GLE-Class, the Lincoln MKX, BMW X5, Volkswagen Touareg and the Acura RDX we drove the week prior. 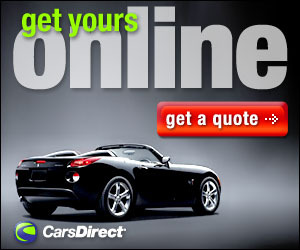 We have had a turn behind the wheel of others, and most are in about the same price range. Yet we like this RX 350 a little better than the others. 2016 marks the fourth generation of the vehicle that debuted in 1998. 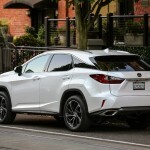 The RX is now sleeker, wider, and longer with a higher ride height. The interior now has a bit more room and a lower rear floor section gives rear passengers a better seating position. This five-passenger midsize crossover SUV is available in two versions: regular and F Sport. Being a Lexus there are loads of standard features like automatic LED headlights, LED foglights and running lights, 18-inch wheels, a power liftgate, keyless ignition and entry, selectable drive mode settings, dual-zone automatic climate control, and eight way power front seats with two-way power lumbar adjustment. But there’s also a rearview camera, “Safety Connect”, Bluetooth phone and audio connectivity, along with the Display Audio tech interface, that includes a knob controller and an 8-inch display and a nine-speaker sound system with a CD player, satellite and HD radio. The F Sport adds sportier exterior styling, 20-inch wheels, adaptive suspension dampers, more drive mode settings, an engine noise enhancer, transmission paddle shifters, special gauges, heated and ventilated sport seats, leather upholstery and F Sport interior accents. Depending on where you live, you can have options as a package or on their own. There’s the Premium package that adds automatic wipers, driver memory functions, leather upholstery, wood trim a rear armrest storage compartment and roof rails. 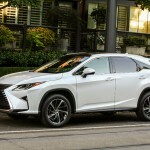 Adding the Navigation package will add of course navigation, along with the Remote Touch electronics interface, a bigger 12.3-inch display, voice controls, the Lexus Enform App Suite and a 12-speaker sound system. The Luxury package includes the Premium package items but adds 20-inch wheels, heated and ventilated front seats, a heated steering wheel, rear door sunshades, upgraded leather upholstery, four-way front seat lumbar adjustment, heated rear seats and power operation for the folding and reclining rear seatbacks. With the Luxury package you can add a rear seat entertainment system, with two 11.6-inch angle-adjustable screens, a DVD player, an HDMI port and a 120-volt household-style power outlet. If you have one of the packages you can add such things as a blind-spot monitor with rear cross-traffic alert, a panoramic-view back-up camera and either a regular or panoramic sunroof. Also a Lexus Safety System + package with adaptive cruise control and accident avoidance features is available. 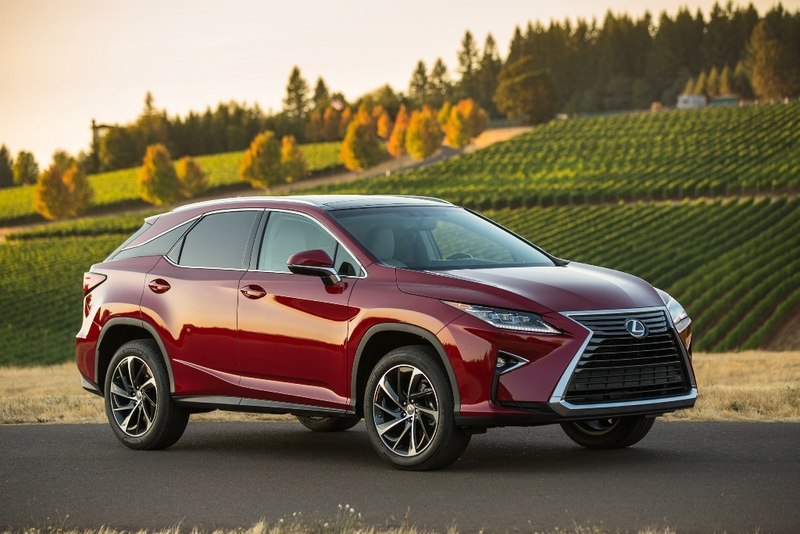 Every 2016 Lexus RX 350 gets a 3.5-liter V6 engine with 295 hp (up 25 horses from last year) and 267 pound-feet of torque under the hood. An eight-speed automatic transmission and front-wheel drive are standard. All-wheel drive is optional, but standard with F Sport. My tester for the week had many of the options available in the packages such as the Remote Touch electronics interface, the bigger 12.3-inch display, and the 15-speaker Mark Levinson premium audio package. We also had the color heads-up display, the panorama moonroof, blind spot monitor and all wheel drive. I had the chance to test the 2013 RX 350 F Sport three years ago so knew what the RX should look like. I was of course wrong. The latest RX really sleeker looking than the old; its less like a bubble and more like a car. The new signature spindle grill can’t be missed. It looks like the gaping jaw of a whale ready to swallow up Jonah. 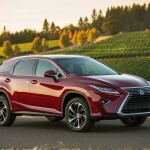 That’s not a bad thing, in fact the RX 350 looks less like an SUV than ever, and more like a sedan on steroids. Inside the fit and the finish are very, well, Lexus. We had leather accents and bamboo trim which, in our opinion, is one of the best trim finishes on the market today. There is indeed plenty of room and the ride height is very good. The 12.3 inch display is mounted in the middle of the dash above the center stack and although there was a wish that it would disappear ala Audi, it’s mounted in such a way as to not be too intrusive. 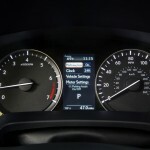 While driving it is much easier to see than some others that have the display buried into the center stack. On the road the power is adequate and the eight speed transmission shifts effortlessly. There is a bit more road noise intrusion into the cabin than we’d like, but turning up the excellent sound system provides an effective mask. At the end of my week I knew that the RX 350 would be my current favorite among luxury crossovers. Maybe it’s the look, the ride, or the interior space. No, I surmised, it’s actually all the little things that make it our favorite. Like the intelligent cup holders that can be adjusted to fit taller cups, a nice thought. Then there’s the overall layout. The interior seems to have been designed by those who would drive such a thing. 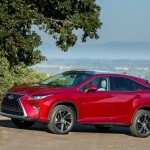 I could picture the designers leaving their CAD computers and actually sitting inside the RX 350 and really feeling what it’s like to drive and ride. With some of the others I’ve felt like I was driving something made for the masses; with the RX 350, even though mass produced, makes one feel as though it was built just for them. 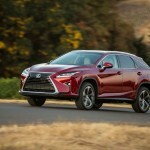 Little wonder then that the Lexus RX 350 is the top seller for Toyota’s luxury brand. When you put together all the small things, you end up with a very good package indeed.